or the Virtual Observatory meets the real world ! Cartes du Ciel (CdC) is a Planetarium Program available as freeware which can be downloaded from the Internet. This is a very powerful programme that has a large feature set. In common with most similar programmes in addition to the planetarium functions it allows you to control a telescope using the ASCOM drivers. It can also follow the position of your telescope using the same connection. Amongst the other features you would expect to find in a planetarium programme CdC can send and receive positions from Virtual Observatory applications using the SAMP (Simple Application Messaging Protocol) hub and protocol. 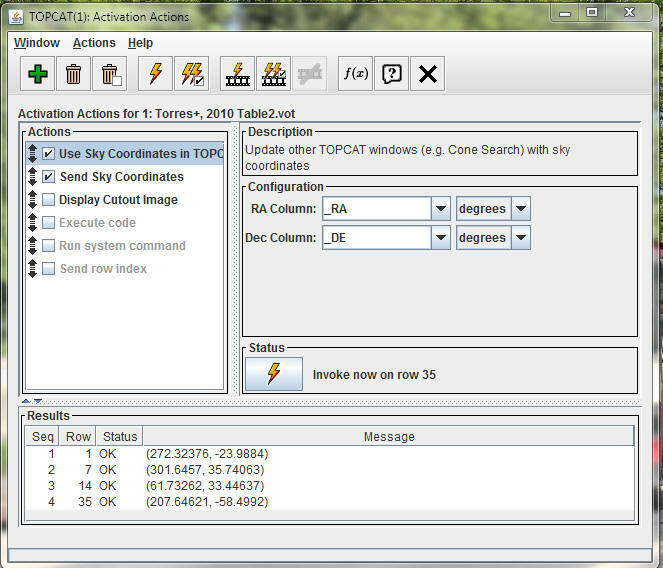 This open up a number of possibilities which include downloading Astronomical Catalogues into an application such as TopCat and then sending the individual objects to CdC. If you have CdC connected to your telescope this can be instructed to slew to the object. Another option is to transmit positions from CdC to Aladin - this way you can get a more detailed image of the sky than is possible in CdC and also allow for various catalogues to be overlaid on the Aladin Image. This includes overlays such as Simbad that contains over 8 million stars and galaxies though not all are observable with an optical telescope. A number of Virtual Observatory Applications use SAMP to allow information to be passed from one application to another. In this case we are constrained to position information but this still allows you to achieve lot of interoperability. Start Aladin - you will need a broadband Internet connection to download the data. The little icon that looks to me a bit like a radio telescope in the bottom right of the Aladin window should be showing some 'radio waves' coming out of it to show it is connected and hovering your mouse over it should show the SAMP connected tooltip. If you wish you can also check in CdC by executing File - SAMP - SAMP Status. This should show connected and also shows the applications that are connected to the SAMP hub. In this case it will only be Aladin but you can have more than one application connected. That's all - if you set the connection to automatic and don't feel the need to check you don't in fact have to do anything just open the applications. Having connected the applications with SAMP you can now use the interoperability. A couple of examples follow. A tip to remember is that Aladin does not contain details of the planets nor the Sun. Move CdC to the required Position using the search or calendar or alternatively you might have it following your telescope. Right click on the object who's position you want to transfer to Aladin. If you then open a an image for instance the DSS image in Aladin or the Simbad catalogue it should appear centered on the position sent from CdC. If it is not centered send the position from CdC again. That's it - easy ! Move Aladin to the required object for instance by typing it in the search box. If you have your telescope connected it should slew to the same position. Just be aware that the orientation of the two displays may not be the same and the view through your telescope may be different again. A couple of suggestions of things that you can use this for. Aladin does not contain details of the planets - if you want to see the star field round a planet you can send the planet position from CdC to Aladin and it will center on the position - the planet should be where the cursor is. On the bottom of the page open the Aladin Applet - it may be best to close the original copy of Aladin but it will work with both open. You can download a catalogue from Vizier either full or partial and then transfer it to CdC so the objects appear just like other catalogues. I have found a couple of problems with this however. First Vizier does not seem to want to talk directly to CdC even if you have started an independent SAMP hub. Not sure why this is but if you open TopCat as well which will provide the hub Vizier will broadcast to TopCat Ok. TopCat can then be used to broadcast the table to CdC - this seems to hang at the end but the data still seems to arrive though I have not checked for any corruption or missing data which probably will happen on the last line.